I am so excited to share this project with you! 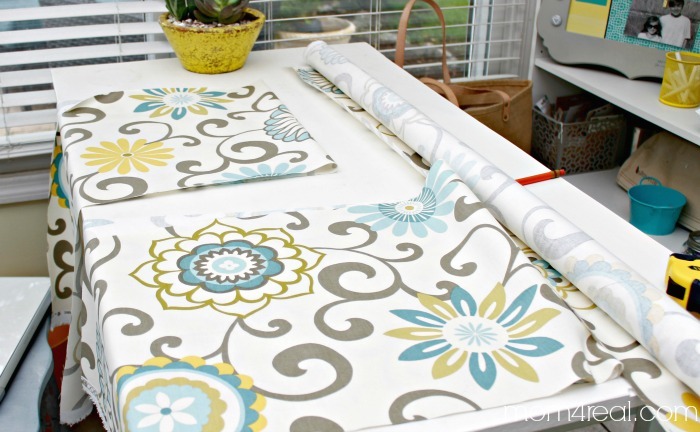 Making my own curtains is one of my favorite things to do…you have so many different options when you make them yourself. You can choose different fabrics, different styles, and you don’t even have to know how to sew! 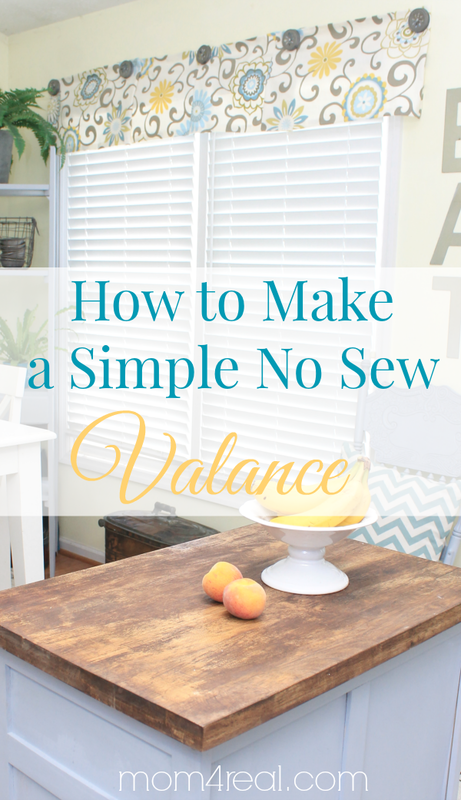 Today I’m going to show you my go to way to make an easy no sew valance! 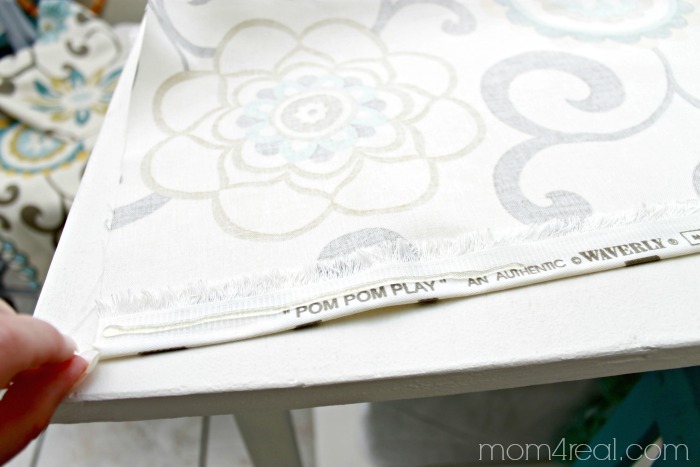 All you need is some fabric, a glue gun and something to hang them with! Bonus Alert! 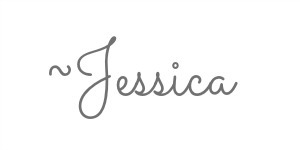 I’ve joined 4 other amazing bloggers who are also sharing no sew projects today! At the bottom of this post, I’ll leave the links to their posts as well, so you can play along with us! Okay…Let’s do this! 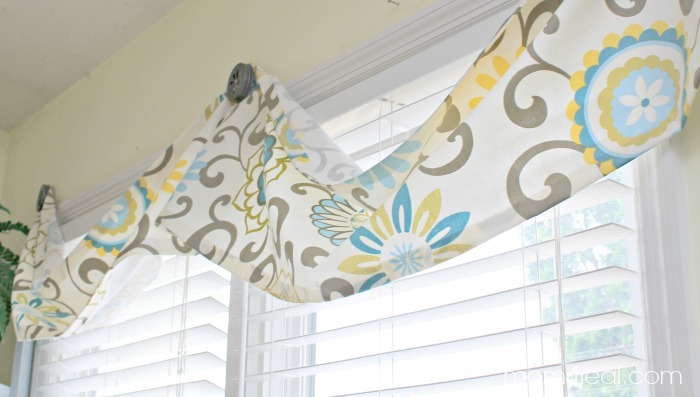 Start by measuring the width of your window/windows and consider how far down you would like your valance to hang. I like to make a fancy fold in the middle of each of my valances, so I measure my fabric 8 inches wider than my window is. 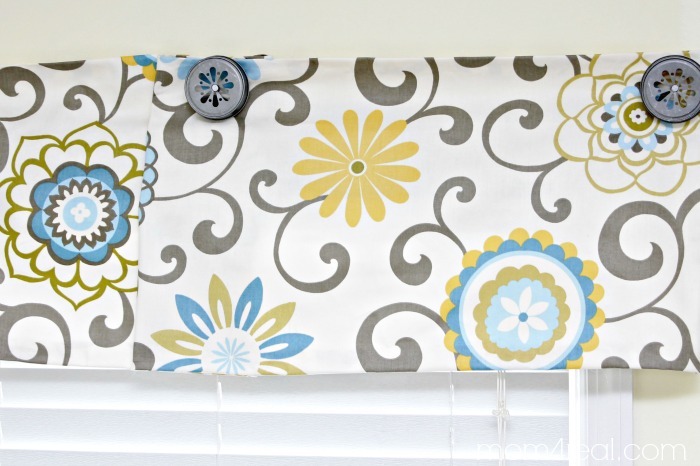 If you just want a plain valance with no extra fold, measure the width of your window and cut your fabric 4 inches wider than your window. For the length (from top to bottom), add two inches when cutting your fabric. Let’s start with the sides (short part of your fabric panel). I went ahead and left the raw fabric edge since I am folding it over any way. Lay your fabric wrong side up, place a long bead of hot glue on down the edge, and fold the end over (about one inch) pressing down to adhere the fabric together. Continue all the way down one side. Now place a long bead of hot glue down the middle of your folded over fabric and fold it over again, pressing down lightly to adhere the fabric. This is what you should see at this point. You have a nice double folded edge. 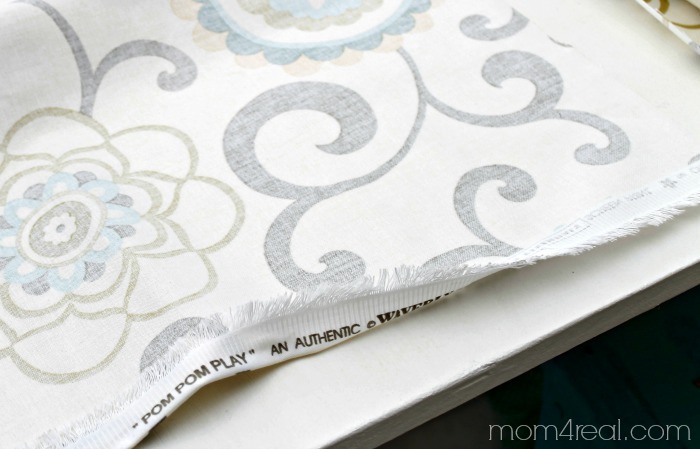 Repeat this process on the other side of your fabric panel. Now for time for the top and bottom of your fabric panel. I don’t worry about doubling the fabric over here, just follow the step of the first side and spread a bead of hot glue across the fabric then fold over, pressing to adhere the fabric together. You may have to do a bit at a time to be sure the glue doesn’t dry before you get it pressed down. 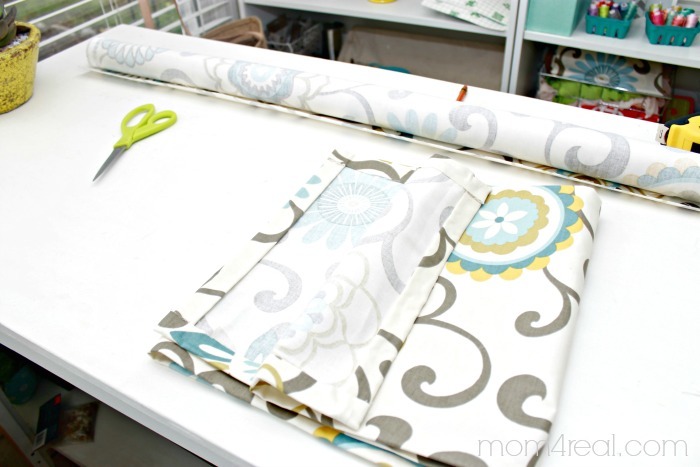 Your fabric panel is ready…if you have more than one valance to hang, just repeat the process! Now, let’s hang them. I am using nails…no worries, we are going to cover them up. I can’t really use a curtain rod, because they always just seem to fall out of our walls. I started by nailing each side above the windows (one in the middle of the two windows and one on the outer edge). I did this for both valances. The reason mine are hanging in the middle is because I like to add a fold in the middle to make them look a little more custom. If you didn’t leave the extra space, ignore the hanging part up there and move to the next step. Now I have cute little valances, and it literally took me less than 10 minutes to make them and hang them. Plus, I didn’t have to get out my sewing machine! 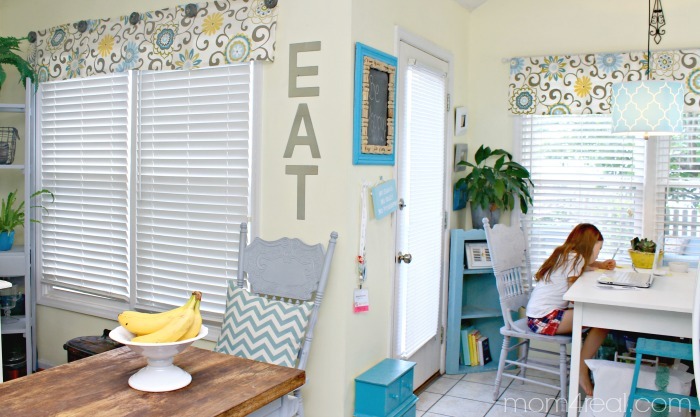 Now everything matches and my dining room flows with my kitchen and breakfast nook…cute, right? « Let’s Talk Mother’s Day ~ Give The Gift of Clean! thanks for this tutorial. I know what I’m going to do for my back door in my den! Love the mason jar caps. 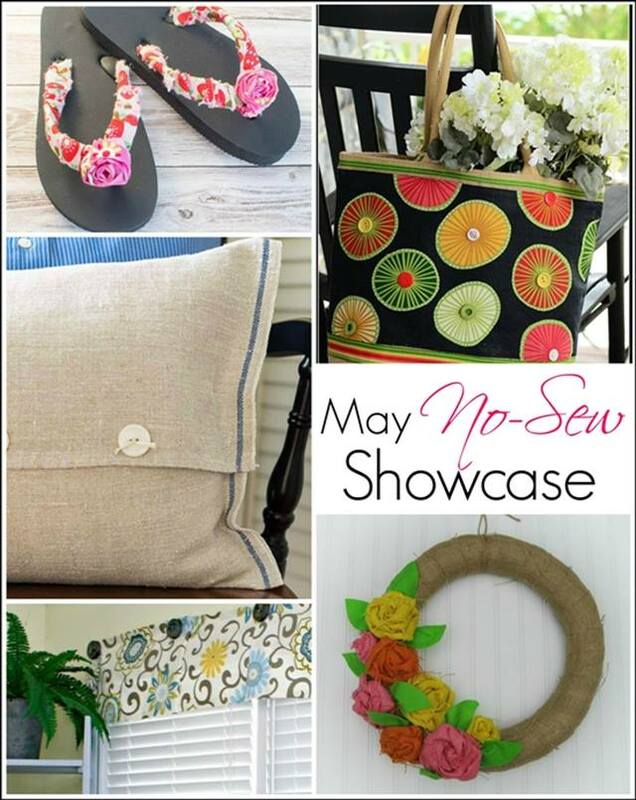 So glad to have you as part of this month’s No-Sew Showcase. 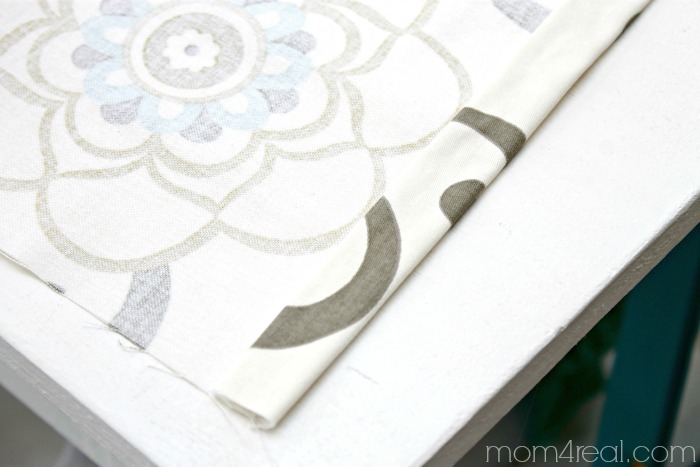 The valances look fabulous, and hot glue and 10 minutes is my kind of project. And I love those mason jar lids you used for your tiebacks. So custom. I have been on the hunt for more of those lids at the Target dollar spot, but they are sold out all around here. These are super cute, What kind of fabric did you use? Thank you, Tia! I used Waverly’s Pom Pom Play Spa fabric from onlinefabricstore.net Hope this helps! HI. Can you tell me the name of the curtain print? This was the best idea. Doesn’t take long to do. I am not fond of sewing so I loved this option. It turned out perfect! 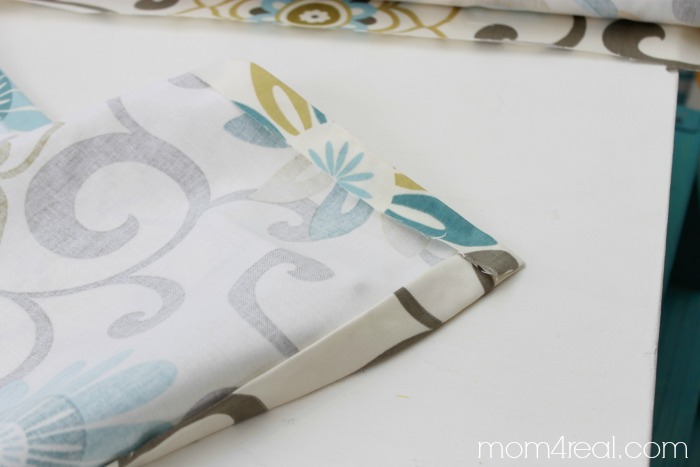 Hi, can you tell me how much fabric you need for a simple valance like that as I’m trying to figure that out before I buy the fabric. I need to make 5 valances (for standard size windows). I have made the valance in the instructions-it came out awesome! 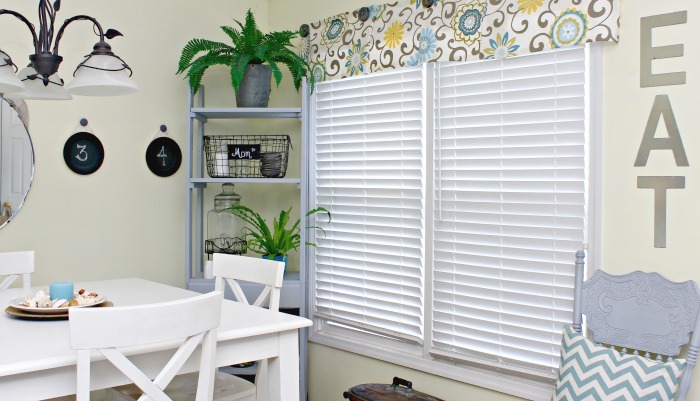 I did notice in the picture with the white kitchen table you have a valance on a rod-are the instructions for that the same?